The XBI and IBB fell 4.16% and 3.38% last week, respectively. When the markets experience a rough period (be it day, week, month or quarter), seize the opportunity to scan for stocks swimming against the tide. Below I touch on 5 stocks that popped up in my scans, giving an opinion and potential plan of action for each. 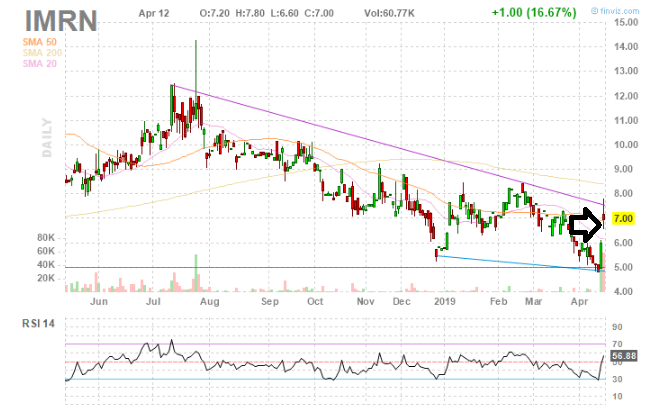 Acer Therapeutics appears to be offering a run-up opportunity into its June PDUFA date. I'm expecting a positive data readout for InflaRx's phase 2b study evaluating IFX-1 in patients with moderate or severe Hidradenitis Suppurativa. On the other hand, both benchmarks are sporting healthy gains year to date, and an "off week" in and of itself shouldn't be a reason to stop scanning for new ideas. Thoughts: I published an article on this one within the marketplace service ROTY back in late January. It's an interesting rare disease play with multiple irons in the fire and a very experienced management lineup, including Chief Medical Officer Dr. Will Andrews (served as medical lead for multiple rare disease launches, including Xopenex HFA, Brovana, Alvesco, Omnaris, Catena and Juxtapid). Lead program EDSIVO (cellprolol) in treating vascular Ehlers-Danlos Syndrome (vEDS) patients looks intriguing considering that these patients have little in the way of options outside of surgery, with an addressable market of up to 5,000 individuals in the US alone. Even an ultra conservative number (2k patients, $200k price tag) leads to peak sales estimates of $400 million and leaves considerable upside via higher pricing or more patients identified. 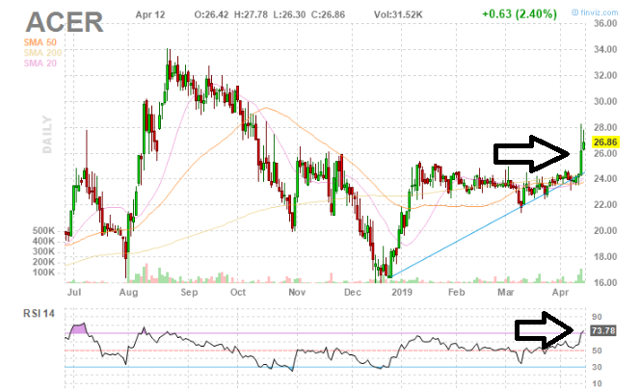 The June PDUFA date provides us a near-term catalyst to look to and there are other assets with material events upcoming (NDA filing for osanetant 2H 2019 and NDA submission for ACER-001 in UCD in Q4). Potential Plan: Traders can play the run-up into PDUFA date, while investors could consider holding longer term as EDSIVO (hopefully) reaches approval and commercialization plus other assets in the pipeline progress. Thoughts: This one was the subject of my most recent public article on Seeking Alpha, as it possesses a novel technology platform that enables them to develop a new class of drugs to engage the body's own natural protein disposal system to address certain oncology indications as well as other diseases. 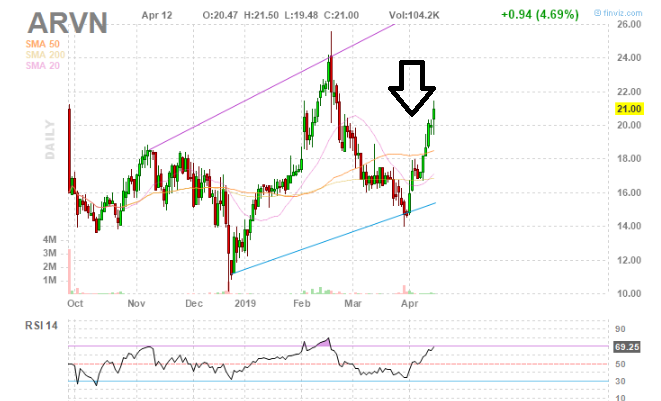 They have a strong management line up, validation from big pharma in the form of partnerships with Pfizer (NYSE:PFE) and Genentech ($1.4 billion in milestones plus royalties) and key catalyst coming up in the form of early data from the phase 1 trial of ARV-110 in mCRPC patients in 2H 2019. If the protein degradation hypothesis is found to hold water, validation of the technology platform could result in a significantly higher valuation. 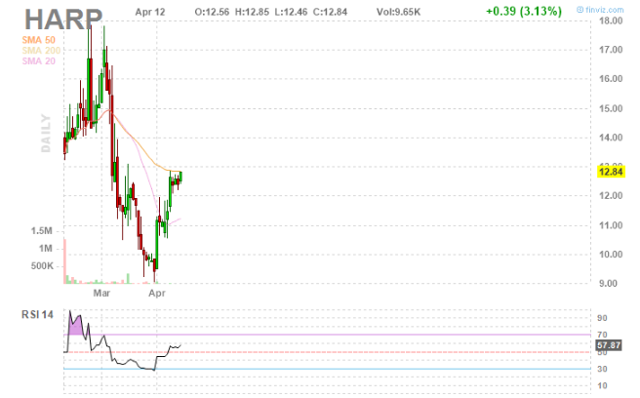 On the other hand, the stock has already run up considerably from when my article was published. Potential Plan: I can't recommend this one at this point, as disappointing data would result in high downside, and in ROTY, we look for significant downside cushion (via prior data readouts and other means). A good plan at this point could be to sit on the sidelines and wait for data, deciding whether to enter later on based on data and resulting valuation. Thoughts: I wrote a public update piece on this one last November, stating my expectations of a positive data readout in 1H 2019 from the phase 2b study evaluating IFX-1 in patients with moderate or severe Hidradenitis Suppurativa. I noted that a large market is being addressed (around 200,000 patients in the US alone), of whom 50% do not respond or lose response to Humira (sales set to hit $21 billion in 2020, but generic competition coming by 2023) and that the trial appeared significantly derisked given prior data. Humira doesn't set the bar as high as one would think, as it offers only a 50% response rate at 12 weeks and around 50% of patients successfully treated the first time around encounter secondary failure. 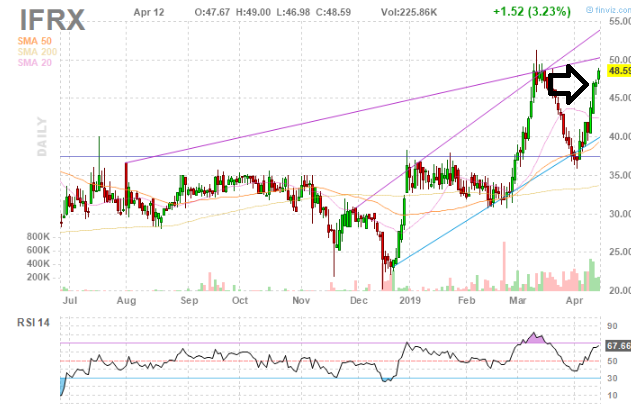 Key institutional holders I keep tabs on such as Adage Capital and RA Capital own large stakes as well. Potential Plan: For those who followed the suggestion in my last article, you're likely sitting on a high percentage gain at this point. My suggestion would be to take partial profits and continue holding perhaps a half-size position through the data readout. Thoughts: I wasn't familiar with this one at all - a tiny, speculative Australian biotechnology firm seeking to target inflammatory-mediated and infectious diseases with oral immunotherapies. At first glance, lead program IMM-124E looks to be a pipeline-in-a-product, pursuing NASH, pediatric NAFLD, colitis and other indications. Anti-infective program IMM-529 is targeting C. difficile with data due 1H 2019. 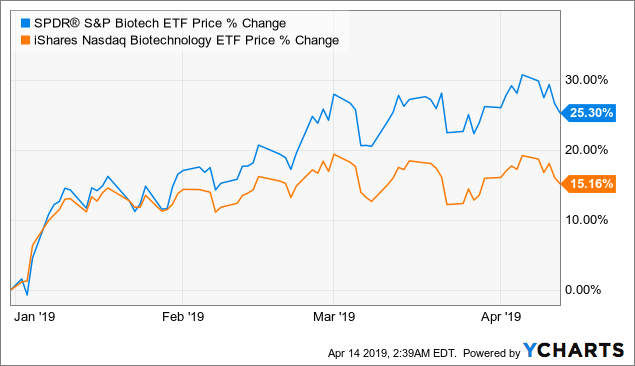 A search of news articles about the name reveals several titles that seem a bit over the top (a red flag) and the NASH field is already too crowded with several quality assets in late development at big pharma and midcap biotech companies. Plan: I'm not much for these small speculative plays and this one is no exception. I'm always open to opinions, but when scanning for stocks, I try to say "no" as much as possible in order to concentrate on just the few stories that are most appealing to me. Thus, this one is a "pass" for me. Thoughts: This semi-recent IPO had crossed my radar before, but again, I confess I'm not overly familiar with this one. The company's TRiTAC platform looks interesting with lead candidate HPN424 the subject of a phase 1 study in prostate cancer and HPN536 set to enter the clinic to be evaluated in ovarian and other mesothelin expressing tumors. Another interesting asset in a crowded but lucrative field is HPN217 targeting BCMA for the treatment of multiple myeloma. The company intends to have four TriTACs in on-going clinical trials by the end of 2020, and so this story could take quite some time to play out and generate enough data for us to make a more informed decision. A history of advantageously accessing financing, including November 2018's Series C financing, is a green flag and early data for HPN424 suggested HPN424 activated T cells in a manner that is consistent with target engagement (and supported once-weekly dosing with manageable side effects). 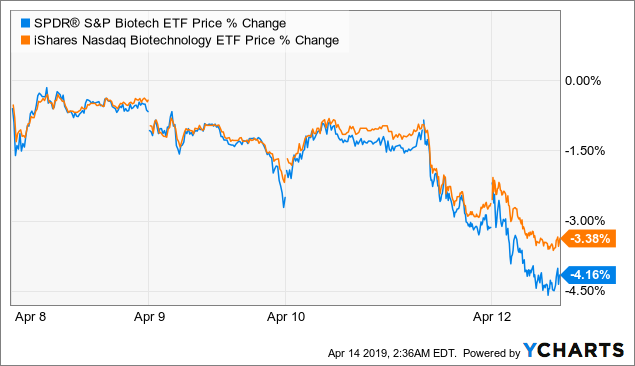 Potential Plan: As with other early-stage biotech companies, I prefer to stay on the sidelines until I see data sets that give us the derisking & validation necessary to have the confidence to enter the stock. I constantly encourage readers to be very selective with the pitches you swing at, only choosing the stories that interest you most and which you have a thorough understanding of. Risks: It goes without saying that as with all biotech companies, disappointing data could result in high downside (especially for single asset stories). Setbacks in the clinic, safety signals, heavy competition for certain indications and targets, and likelihood of further financing/dilution in the near to medium term are other risk factors some of the above ideas have in common. Additional disclosure: Disclaimer: Commentary presented is NOT individualized investment advice. Opinions offered here are NOT personalized recommendations. Readers are expected to do their own due diligence or consult an investment professional if needed prior to making trades. Strategies discussed should not be mistaken for recommendations, and past performance may not be indicative of future results. Although I do my best to present factual research, I do not in any way guarantee the accuracy of the information I post. I reserve the right to make investment decisions on behalf of myself and affiliates regarding any security without notification except where it is required by law. Keep in mind that any opinion or position disclosed on this platform is subject to change at any moment as the thesis evolves. Investing in common stock can result in partial or total loss of capital. In other words, readers are expected to form their own trading plan, do their own research and take responsibility for their own actions. If they are not able or willing to do so, better to buy index funds or find a thoroughly vetted fee-only financial advisor to handle your account.